TORONTO — The more things change, the more they stay the same. How many times can the stakes be the highest they’ve ever been? When you’re a once-down-on-its-luck franchise in the midst of an incremental, unprecedented rise, it can happen every year. When the ambitions of the front office match its penchant for risk, its willingness to shed anything and anyone in pursuit of a championship, it can happen every year. Toronto Raptors president Masai Ujiri bet the house on this playoff run when he flipped DeMar DeRozan, beloved franchise icon, for a year to woo superstar Kawhi Leonard into staying in Toronto long term. It’s safe to say Leonard, who betrays very little outside of a single-minded desire to win, will take the Raptors’ playoff success into consideration when he makes his decision. The Raptors lost Game 1 of their first-round series to the Orlando Magic in a 104-101 nail-biter — their 14th Game 1 loss in the last six years. Only 7 percent of teams have ever made it back from a 2-0 deficit. So it is that Game 2, for the umpteenth time, will be most important in franchise history. Former head coach Dwane Casey is in Detroit and DeRozan is in San Antonio, but the arena was littered with ghosts of the past. There was former Raptor Terrence Ross, traded for current Raptor Serge Ibaka. Jonas Valanciunas, who was shipped to the Memphis Grizzlies at the trade deadline for Marc Gasol, was also in attendance. And then there were the ghosts the Raptors wish they could vanquish: vanishing stars, missed wide-open shots and an inability to handle quick point guards. Kyle Lowry, whose playoff reputation has been skewed by a few punctuating failures that are hard to vanquish from the publicconsciousness, notched another one. He scored zero points in his 34 minutes. Lowry, to be fair, remained his regular floor-burning self, taking haymakers and drawing charges and pushing the action. The Raptors outscored the Magic by 11 when he was on the floor. But, man, that zero glares and damns. It demandsthe headline. His two free-throw misses in the third quarter — Lowry usually shoots 83 percent from the stripe — felt like an absurd joke. Magic point guard D.J. Augustin, even at 31 years old, possesses the speed and shiftiness that used to put Valanciunas’ slow feet in fits. On Saturday, all of his 25 points came with Gasol, smart but stocky, on the floor, including the game-winning three — although you can’t blame him for that one. Leonard, guarding Augustin, was supposed to fight over the screen. But he switched instead, leaving Gasol on an island with two feet between him and the game’s hottest shooter. “Our goal was to make the playoffs but just not make it,” Augustin said after the game. “We want to make noise and win a series or two. We feel like we can. We believe in ourselves.” They announced their ambitions in a big way, punching the Raptors in the mouth in precisely the manner they intended to. Before the game, Magic coach Steve Clifford said his team planned to limit Toronto’s transition game by keeping turnovers at a minimum, crashing the boards and forcing the Raptors to play in the halfcourt. They committed only 11 turnovers and hit a ton of shots, and despite the Raptors’ best efforts, it’shard to push the pace when you’re taking the ball to the basket. 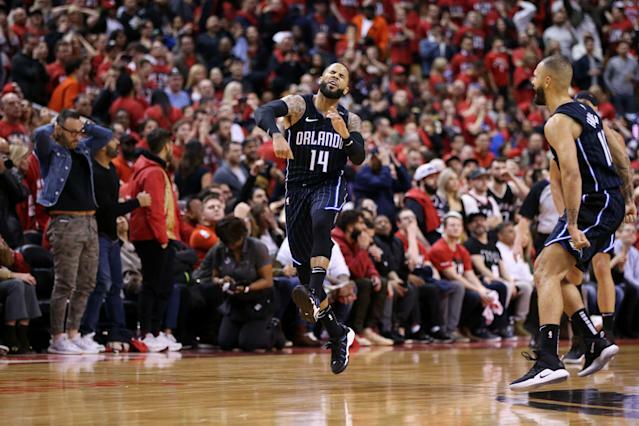 The Magic were crisp, physical and disciplined, and the Raptors couldn’t match their intensity, failing to muster a consistent defensive stretch outside of the third quarter. Sure, the Raptors missed wide-open shots, and the Magic hit some tough ones. But they could have seized control of the game’s inevitable randomness had they treated it with the urgency it deserved. If there is a psychological quality that separates these Raptors from the old ones, it’s their lack of neurosis. It’s easier to treat every problem like it’s solvable when it actually, you know, is. Confidence, after all, is a measure of work multiplied by talent. This roster knows it is talented, and it might be the East’s most versatile. High noon isn’t until Tuesday. The Raptors have two days to pore over their mistakes and figure out what the hell happened, two days to internalize the stakes while trying not to become paralyzed by them. We’re about to find out if that’s true.